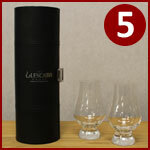 Wineware's Top 5 Wine and Whisky Christmas Gifts Under £40! With less than 5 weeks to go until Christmas is finally here, the season of gift and present buying is in full swing. This year, why not think outside of the box and treat your loved ones to something a little different and give unusual Christmas gifts. Wine glasses and other wine / whisky accessories will certainly fall into that category, maybe your Dad loves a drop of Whisky but doesn’t have a set of stylish whisky glasses, or your mum favours red wine but has never thought of a wine decanter? Below we’ve listed our top 5 products priced under £40.00; they’re all wine or whisky related, of a high quality and are exceptionally great value! This 5 piece decanting set from Menu offers you’re a variety of different options to aerating your wine. Using a set like this allows you to speed up the aeration process, in turn creating a more flavoursome and enjoyable wine. This gift boxed set from Menu is sure to impress you recipient and they’ll feel like classy wine enthusiast! Price: £33.50 – Click here to view more. 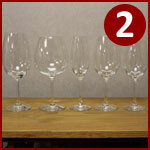 We couldn’t create a top 5 wine gifts under £40.00 without mentioning one of most popular glassware ranges, Schott Zwiesel Ivento! This great value range features 5 different glass types, Bordeaux, Burgundy, Red Wine, White Wine and Champagne, so it covers most bases! Like every Schott Zwiesel glass, they’re made from their very own Tritan Crystal which provides great durability and brilliant clarity. The Ivento range is popular both with home users as well as restaurants and bars due to not only their excellent quality, but timeless design. Price: £30.50 per box of 6 – Click here to view more. You should always store your collection of wine (whether it’s small or large) at a horizontal angle as it keeps the cork wet (vital) and it stops you from knocking it over! Our small, 12 bottle wooden wine racks from Vinrack can be assembled in a matter of seconds, perfect if you have a small collection of your favourite wines at home in your kitchen. 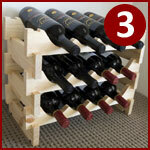 This simple yet effective wine rack can sit proudly on a kitchen worktop or within a cupboard, it’s up to you! Available in natural pine or a dark stain. Price from: £22.95 – Click here to view more. The ‘Cheers’ wine decanter from Leonardo makes a great gift for someone who’s new to wine drinking or is looking to enhance and educate themselves further. 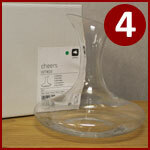 This classy decanter is great value for money as it’s made by hand, has a wide bowl and can up to 1500ml. You’re able to effortlessly aerate your wine by swirling your decanter, speeding up the vital aeration process. 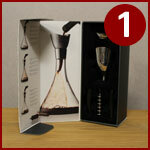 The decanter is supplied in a plain white box, perfect to give as a surprise Christmas present! Price: £36.00 – Click here to view more. The Glencairn whisky glass is famous all over the World and is used by master blenders and connoisseurs. We provide this stylish and unique glass in a variety of different quantities, packaging and gift boxes, but our favourite is the ‘Travel Case’. This faux leather case holds two Glencairn whisky glasses, they’re well protected due to the felt interior and has the classy Glencairn logo printed on the outside of the case. We’re sure this classy set will put a smile on Dad’s face this Christmas! Price: £30.00 – Click here to view more. Wineware’s top 5 Wine and Whisky Christmas gifts under £40 are all available to buy online or via the phone. Further more, click here to view our array of other Christmas gifts! Alternatively, if you can’t decide on what to purchase, why not choose a Wineware Gift Voucher and let your loved ones decide!